I was interested to find a story about a local Vegetarian in Invercargill's Newspaper, The Southland Times. Its a rather odd scenario, a 14 year old vegetarian selling meat for fundraising. Pip Prouting is a scout, just to be clear, Scouts are a group of young people who go camping and earn merit badges. A jamboree is a large national or international gathering for scouts. Here are some extracts from the full article. "Running a sausage sizzle is tough when you are a vegetarian, but that is the sort of sacrifice a scout will make to get to a jamboree. "...about 200 New Zealand scouts would make the trip to the jamboree. At a cost of $2500 a scout, the Southland group had to think about fundraising a long time before the event, he said. But Southlanders' affection for sausages helped out a fair bit, he said. "I cannot believe the amount of people who will eat sausages at all hours of the day," he said. Pip was one of the scouts who attended the previous New Zealand jamboree in Christchurch two years ago, when 30 children were quarantined after displaying norovirus symptoms." Here are some comments from two Vegan friends, from the Veganzchat email group. "Aren't there other ways to raise money I wonder?" meant polishing silverware, cleaning sheds, doing gardening, etc. "A bull which escaped into a crowd of spectators at a Rodeo near Rotorua today was captured with no injuries to the crowd or the animal. The one-tonne bull was in a yard when it jumped a fence and was loose for about 40 seconds, Rodeo secretary Maxine Temoananui told NZPA. A group of "bullfighters" managed to subdue the bull, but it was "pure luck" that no one was injured, Ms Temoananui said. "It was just handled really well." The bull was up and running around, and animal welfare personnel and a vet at the rodeo had no concerns for its wellbeing, she said." I just wanted to mention that story because of how the animal would have been treated. So, the animal manages to get free, but oh no, we cant have that, and it gets "subdued". If the spectators could see this, I would imagine there would have been a large cheer as the "naughty" animal got put in its place. Rodeos are not really part of New Zealand culture, although it seems there is a traveling circuit for the event. I suppose the same "riders" go from place, and "ride" local animals? Another story mentions Australian "riders" also taking part. Te Anau is a beautiful part of New Zealand, its a couple of hours north of Invercargill in the South Island. Its known for its scenery of mountains, lakes and waterfalls. Scenes for The Lord Of The Rings trilogy were filmed there. But, it also is known for the Te Anau Rodeo, which has been going on for forty odd years. Here are extracts from a story about the Te Anau Rodeo. It might seem insignificant, but at yesterday's Te Anau rodeo it was the difference between glory and a faceful of dirt. Heavy rain in the morning brought fears the event would be postponed, as it had been in January, but the weather gods finally bestowed sunshine on the 42nd Te Anau Rodeo, bringing a crowd that swelled to an estimated 2500 by the time the marquee event, the open bull ride, took place, organisers said." So by Te Anau standards, a swollen crowd numbers about 2500, wow! "Commentator Bruce Campbell summed up proceedings best by saying the eight-second window was key to the larger events. "It's not very long, eight seconds, but when you're sitting on half a tonne of beef ... it's a long time."" "Competitor Ben "Possum" Watson, of the Hakataramea Valley, said in eight seconds time could stand still. "It is a long time ... a lot of stuff goes through your head." However, man beating beast and time was only part of the recipe for success, one judge explained. "It's scored out of 100, 50 points for the rider and 50 for the bull," he said." "Young cowboys and cowgirls also got their chance to impress in the junior steer ride, calf ride and sheep ride. For many it was their first time in the rodeo arena. Nine-year-old Kate Turnbull, of Te Anau, was unfazed after pitching over the neck of a calf into the gravel after two seconds on her first-ever attempt. "I didn't hurt myself – I was just fine ... as soon as I was off I was done."" I hate seeing children at rodeos, they get indoctrinated that its ok to treat animals in this manner. Another story in The Southland Times was about a "potato pest". "A Southland potato grower is setting insect traps to test for a potentially harmful pest that has cost the industry about $47 million since 2008. The tomato potato psyllid was discovered in the North Island last year and in some cases had wiped out almost 70 per cent of crops. Southland-based Pyper's Produce co-owner Brendan Hamilton has set up four sticky insect traps in one of his potato patches to catch any psyllids that might have migrated south. The pest injected toxins into potatoes that would cause them to turn zebra striped and black when cooked." Stopping here, notice the word TOXIN, and that this TOXIN makes the potatoes turn BLACK when cooked. Sounds gross, and deadly right? Wrong. Back to the story. "The toxin cannot harm humans, but the change in looks meant the potatoes would be unsaleable, he said." Oh dear, so these awful TOXINS, no doubt INJECTED by a PEST, all they do is make the potato go a different colour when you cook it? I'd gladly eat black potatoes, if they were the same apart from colour, didnt hurt any bugs, and cost less. I was interested in the photo that went with the story, the farmer was putting up large sticky pieces of paper. Essentially, these are glue traps, for flying insects. Glue Traps are being banned worldwide, they are used for catching mice, and other ground "pest" animals. The animal touches the sticky paper, and is stuck, to starve to death since they cannot move. But, these traps also kill birds who touch them, and so they are being removed from sale. These sticky pieces of paper, attatched to a stick, like a banner beside the crop, surely these will catch butterflies and "good" insects, possibly birds, although Im not sure. Since the paper is hanging off the ground, perhaps a bird would be able to get free. In any case, I thought it was an interesting story, since Glue traps placed on the ground are being slowly banned, and that a local farmer is using them to catch flying insects. I dont know much about killing so called pest animals, I dont know if we really have to do it or not. I have a small vegetable garden, and my lettuces and silverbeet get holes munched in their leaves, but its not harm to me personally, I have nothing against the snails or other bugs, they have very small stomachs compared to me, theres plenty to go around. I figure, if I were eating bread, and a small bird appeared next to me, asking for a small bit tossed its way, I'd oblige, so why not let a few insects have their fill from my vegetable garden? Again, I dont know if large commercial scale crop farmers need to kill pest animals, I understand its different to my own personal little vegetable garden. But, the potato pest in the story only leaves cosmetic damage, like the holes that get put into the leaves in my vegetable garden. Its not like we are harmed by black potatoes or a hole or two in our silverbeet. A fair amount of buzz has been reached over a National party politician talking about "cracking down" on animal cruelty in New Zealand. Tauranga MP Simon Bridges has drafted a bill asking for the maximum penalty for deliberately mistreating animals under the Animal Welfare Act to be raised from three years, to five years in prison. I personally dont really see the point of these types of laws, in many ways I dont see how you can punish someone properly for what they do to animals. An eye for an eye would make the whole world blind, and you cannot kill someone twice. Throwing someone in jail for UP TO 5 years instead of the current UP TO 3 years will only cost the country more money. One estimate for the current cost of housing an inmate is roughly 92,000 NZD a year. Lets round up to 100,000, it will cost that much in a year or two anyway. Here are two examples mentioned. "For example, Wayne Williams, 34, was sentenced to four months in jail for beating his partner's dog with a metal pole before strangling it to death. And Peter James Cooksley, 48, shot a cat with a crossbow bolt through the abdomen for entering his house - but was fined just $500. Mr Kerridge said many acts of animal cruelty were committed by people to torment their partners, including a case where a man was sent to prison for 2 months for throwing three kittens against a wall." Using that last example, 2 months in jail would cost about $16,000 currently. Yet, had the man thrown three mice, or 300 mice against the wall, it wouldnt be a crime. If the large crime was because the kittens died, then if the man had brutally killed three wild animals, I doubt anyone would care. I dont see much distinction between the "worth" of an animal. I love my chicken friends, and I dont like cats, but I wouldnt say that a chickens life is any more special than that of a cat. Yet, society would actually go the complete opposite way, that chickens are killed everyday for our food, while cats are protected. Its pretty much illegal to kill a cat for its meat and its illegal to sell clothing made from cats fur, for example. Housing someone who killed a cat or dog, a "pet class" animal, for 5 years will end up costing taxpayers 500,000 dollars, half a million dollars. And for what? Reports are that almost all prisoners go on to reoffend within a few years of release anyway. I really dont know what to do about crime. I dont think New Zealand is as bad as some countries for criminal offending, but we sure get a lot of media hype about crime. One solution by current National Government, who leans Right Wing, is "cracking down" or "getting tough" on crime. New low cost inmate housing is being evaluated, including a proposal of keeping criminals in modified Shipping Containers. We have a few new prisons in New Zealand that get brought up as being extravagant. One near where I live, in Milton, is called "the milton hilton", because among other things it has "underfloor heating" which is a luxury to have in a personal house. But, I bet most large buildings now have it, as its meant to be the cheapest way to heat a large building. I think a prisoner has a right to some sort of basic warmth. Surely, if we imagine someone who was abusive to animals, perhaps "training" dogs for dog fighting, by being cruel to them, keeping them locked up, keeping them cold, beating them, then we can imagine how those dogs turn out. If we do the same thing to the person who did that to animals, how would we expect them to turn out? I would assume they wouldnt come out as a credit to society. My father is into that sort of "cracking down on crime" attitude. He's thought up some great scheme where you'd throw all the prisoners into some building, and they'd sort themselves out. Thats an image that often gets brought up by our media, that we are too "soft" on criminals, and that the country is at war with thugs and drug dealers. That we need all kinds of harsh penalties. I dont see keeping someone locked up for UP TO five years as being a good way to avenge the life of an animal. It will only cost, based on 100,000 a year, half a million dollars to keep them locked up. Of course, all this talk of being tough is just to appease the public. Most will get out on parole , "hey, you didnt kill any other inmates, here, you've been such a good boy, you've served half your sentance, why not go back out into the wild?". Notice the language used by the B list New Zealand celebrities in the ad. They mention that its a "fight" all the time, I guess its similar to "the war on terror" or "the war on drugs". Also, "what would you do if it were your pet", well, I dunno, but I doubt I'd be allowed to lock someone up in my closet for a few years, and it certainly wouldnt cost me a hundred thousand dollars per year. Lastly, one of the people says "to prosecute offenders who hurt, torture, or KILL animals". I guess the police will be showing up at the Freezing Works first then, since its an offense to kill animals. I guess saying the truth would have been to difficult to put in the ad, fine print would pop up as being prosecuted for KILLING animals was mentioned, saying "we only care about certain animals that are cute and cuddly such as cats, and while chickens are superior in every way, they must be grown and then exterminated because its our tradition to eat them". One of the television ads has a celebrity mention "making a move towards animal rights", since "animal rights" has become something of a buzzword. I dont really see making a law change to cost the taxpayers up to $500,000 instead of only up to $300,000 as "animal rights". Putting people in jail after they have killed animals doesnt save any lives. 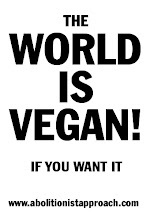 I think Animal Rights means veganism.